Cover mount stamps - what would you like to see? I'm getting ready to start looking at cover mount stamp designs for 2010 (! ), and thought the blog would be a good place to get some suggestions on what you would like to see as a cover stamp. What trends have you seen which you would like to see reflected in our freebie stamps? What kind of images do you like? Which stamps are the most used and loved in your collection? What stamps have you always wanted but been unable to easily find? I'd love to know your thoughts! Thanks everyone. Check out these absolutely stunning cards made with the free Dragonfly stamp designed by Kay Carley, on Lesley's Blog. I am sure you will agree they are gorgeous, and so delicate looking. If you've got a dragonfly creation to share, leave a comment with a link :). It's Christmas already at CS! 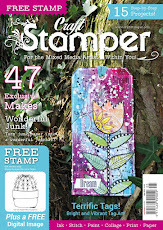 Well, I've now finished commissioning the December issue of Craft Stamper magazine. It's weird working in publishing - thinking about Christmas in July! Many of the stamp manufacturers are in the same situation - they are having to come up with seasonal artwork about now (or in many cases they've already been there, done that already this year!). Wishing away the year is one of the things I don't like about my job. I'm working on October issue right now - and the summer isn't even over yet! You may have seen the information in this month's Craft Stamper about a new show which we are sponsoring called Artisan. It's a show dedicated to the two crafts of stamping and beading and takes place in Leamington Spa on 3rd and 4th October this year. Anyway I mention it as there is a chance to win tickets on our website this month - go here: http://www.craftstamper.com/competitions/ to enter. Anyway, the new issue is out today! There are lots of lovely things this month - Rachel Jackon's Distress Ink cards are lush (on the front cover), there is a fab Metal Masterclass using the Ten Second Studio products, there is a Copic Marker tutorial, some arty canvases, and lots more too. We've also introduced a new feature for beginners as I've been asked again and again for more basic techniques and information. It's called Start Stamping and each issue will feature the lowdown on an inkpad type plus a basic step-by-step technique. I should also mention that the cover stamp this month has been designed by our very own Kay Carley on behalf of The Stamp Man. It's such a pretty stamp and really versatile too. 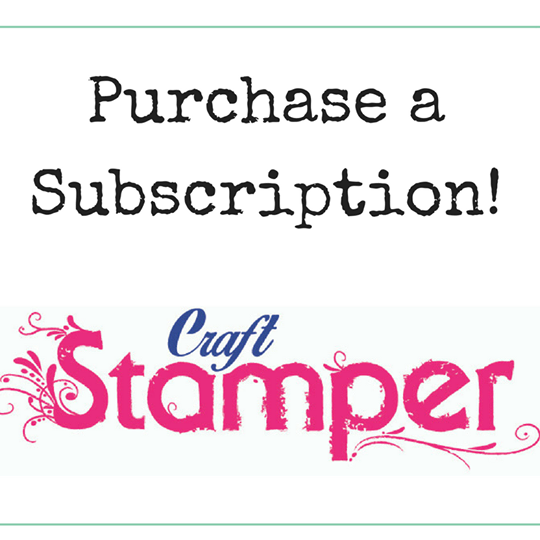 The Craft Stamper website has been updated with the Web Extra stuff too.